Once in awhile I get to have the pleasure of working at the Old Church Gallery in Cedar River, Michigan. I love this gallery! Last weekend was one of those rare occasions and I had an awesome, inspiring day there. The ladies who own it – Carlyn Lynch and Cindy Schmidt – are two of the sweetest ladies ever. 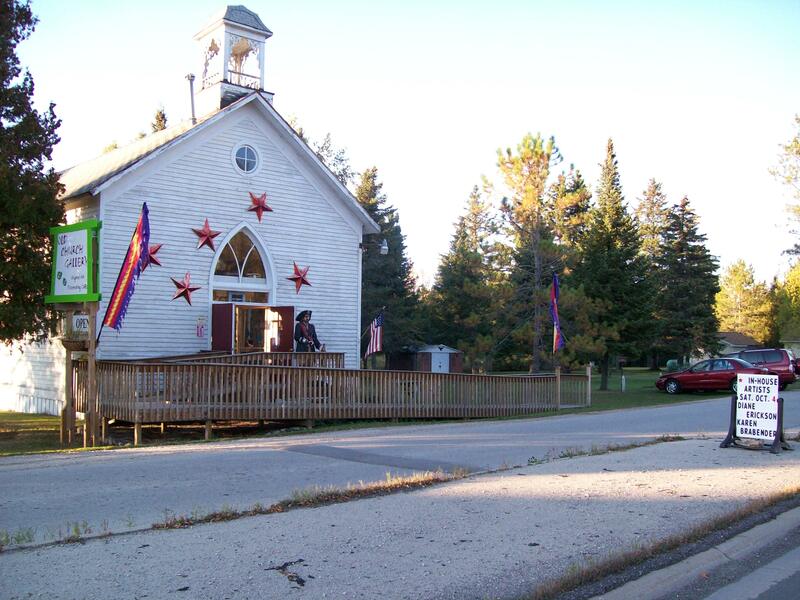 These two women converted an old, unused church into an art gallery in a somewhat remote location and have turned it into a must-stop place on Hwy. M-35 between Escanaba and Menominee, Michigan. It is primarily filled with art from local and regional artists. There are so many talented artists represented here! When I first met the ladies of the Old Church Gallery, I was newly divorced and lacking self-confidence. My friend Karen encouraged (nagged) me into approaching them with my jewelry designs. I was so nervous! But the ladies were fabulous and we have had a wonderful working relationship ever since. Karen and I have done an artist-in-residence day,and this fall we are teaching classes. It has been such a great relationship for me, and I know Karen feels the same. During my hours there, my brain flooded with ideas! I kept jotting things down in my notebook, barely able to keep up! Creativity spurs creativity in me, and this place is SO inspiring! If you’re ever in the Upper Peninsula of Michigan, make it a point to stop in to see the ladies and their wonderful gallery. You won’t be sorry! Karen and I A”muse” Each Other! My friend Karen and I are a riot together. I posted about an Artists in Residence day that we both participated in, and I realized she would make a great post herself. 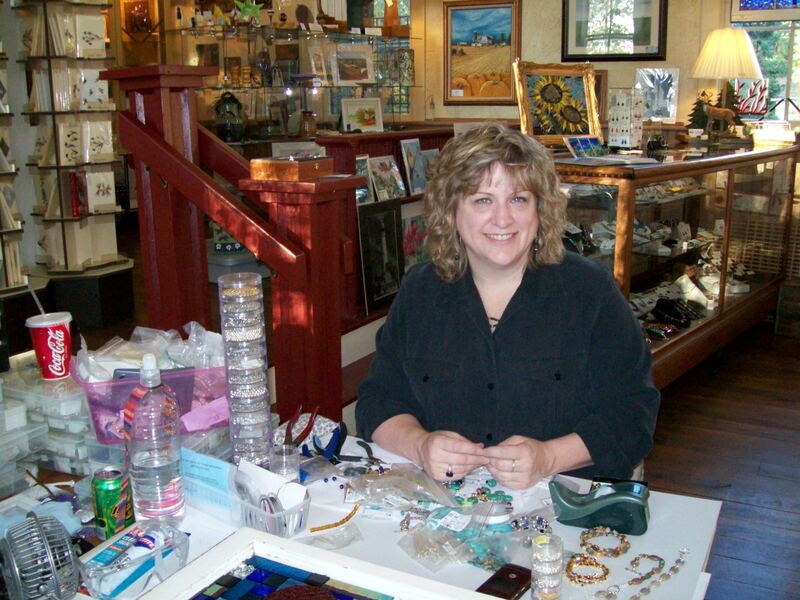 Karen’s business is named Re-Creations Mosaics. She used to be a successful decorative painter and very much in demand, but the stresses on her body were getting to be too much, so she sold that business. Now she channels her artistic urges into her mosaics, and they are something. At first she was timid about showing them to people (she still gives away more than she gets to galleries! ), but I talked her into doing a show at the Peninsula Art School in Door County, Wisconsin (specifically in Fish Creek) and they both sold, which blew her away! I wasn’t surprised because I know how great her work is. She has started to show them more, and I keep encouraging her to do more, because they are wonderful. She and I have been friends since the fifth grade. We were both crazy artist types, and we were the bane of Mr. Jones’ art classes. I know he loved us, but we couldn’t have been easy to have in class. We have always been able to inspire each other, and we sure have fun while we do it. We try to get together regularly to do art projects, sometimes it’s jewelry for me and glasswork for her, but most of the time we try to paint, or collage, or some other medium. She and I also are the leaders of our church Youth Art Ministry (YAM). We get a group of the junior and senior high kids together and go crazy. We call these YAM jams. 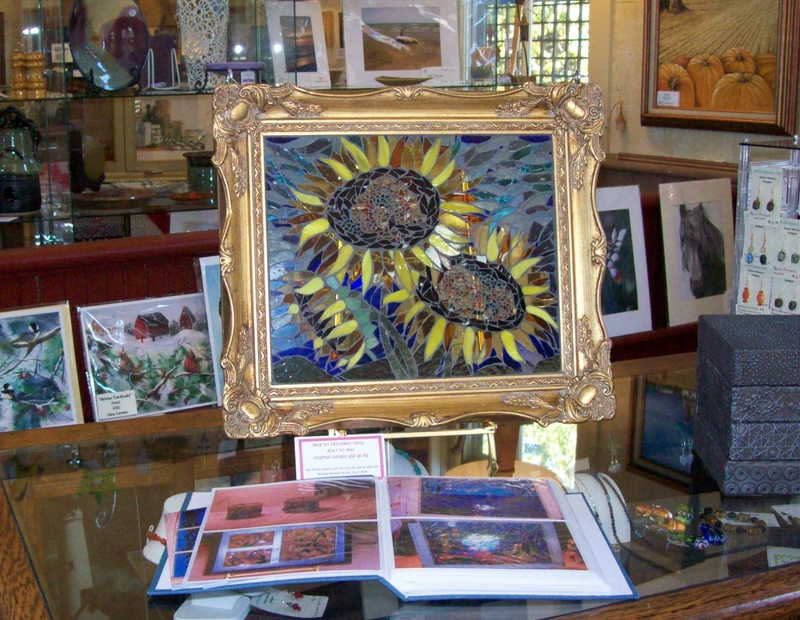 Karen does her mosaics in much smaller pieces than I’ve ever seen – they are literally paintings done with glass pieces. The detail and color is fantastic! She typically does them on old salvaged windows (some from my old house), but sometimes she finds cool old frames and uses those, too. Her creativity is contagious.I am working on her to get a website and Etsy account, etc. For now I will just brag about her on mine. The pictures don’t do her work justice, but I hope you can get the idea. What Do You Know, I’m an Artist! I don’t know why being called an artist always surprises me, or makes me feel all funny inside. Does it sound pretentious? Is it wishful thinking? I don’t know exactly, but it still gives me a thrill and yet makes me feel like a phony at the same time! This past weekend my good friend Karen and I were the Artists in Residence for The Old Church Gallery in Cedar River, Michigan. We brought our respective work and spent the day there, meeting the customers and having a ball together. Karen Brabender and I have been friends since grade school, and we are each other’s inspiration for artwork in a lot of ways. 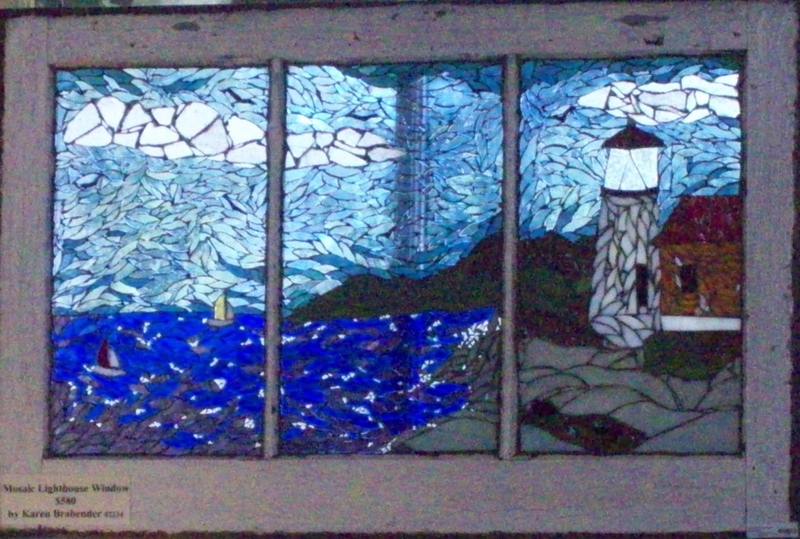 Karen does gorgeous mosaic glass paintings under the business name Re-Creations Mosaics. She takes a lot of old windows and does mosaic work on the glass. Anyway, the day was a great success and they have already asked us to do it again next year, and they are going to be having a lot more artists come in also. People seemed really excited to see us working on our things right in front of them. I love the contact with people – I have always been very outgoing and I love to socialize, so these kinds of events are something I really enjoy. I hadn’t had enough beading time lately, so it was nice to get back to designing and creating jewelry. I have been so busy with other things that I have been neglecting my creative side – my internal artist – and that has to change. That artist inside is important and I need to let her out to play more.